The Case IH AGXTEND range of precision farming technologies provide access to new and exclusive solutions that enhance productivity and efficiency, delivering real-world benefits throughout the year. 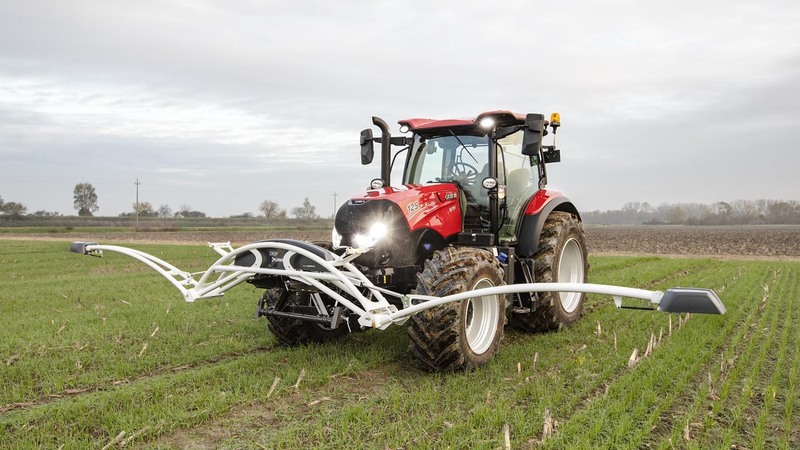 Complementing Case IH’s existing Advanced Farming System (AFS) products, the launch of AGXTEND significantly expands the company’s precision agriculture offering and will eventually include a full range of precision solutions and connected services. A range of real- time weather sensors data to facilitate informed agronomic decision making. Mounted on the tractor’s front linkage CropXplorer uses two highly-accurate optical sensors to measure crop biomass. The data which they collect is then processed, via algorithms, which calculate the crop’s actual nitrogen requirement and then automatically adjust the spreader on the tractor’s rear linkage so that it applies precisely the right amount. CropXplorer also includes a Map + Overlay mode, allowing yield potential maps to be used in combination with on-the-go sensor measurements. Despite its advanced technology, CropXplorer is easy to set up and use. It can be mounted on a standard front three-point hitch or front weight frame and requires no calibration. Control is via a dedicated terminal which is compatible with ISOBUS fertiliser spreaders as well as most non-ISOBUS spreaders that are capable of variable rate application. The SoilXplorer sensor or mapper consists of a contactless soil sensor which uses electromagnetism to measure soil conductivity at four different depths – 0-25cm, 15-60cm, 55-95cm, 85-115cm. The unit can be mounted on a tractor’s front linkage and has two key capabilities. It can be used for mapping fields, to record soil heterogeneity and to determine soil type maps and relative water content maps. Secondly, it provides information that determines the presence and depth of compacted areas, so variable depth soil cultivation can be practiced with compatible equipment. Working at full depth only where necessary saves fuel and metal wear, generating significant cost savings. Xpower, a unique system of controlling weeds using electricity, won Case IH the bronze medal in the 2019 SIMA Innovation Awards. This environmentally-friendly technology replaces chemicals with electricity for weed control and pre-harvest desiccation of crops. Highly-efficient, the system is capable of completely destroying the plant right down to the roots and works via direct contact, with the effects visible in just a few hours. Application booms with working widths from 1.2 to 3m are available. The FarmXtend app, a smart weather application which works with a complete set of connected in-field sensors, allows farmers to monitor in-field weather data and supports their decision-making processes on activities such as spraying. The weather sensors include the WeatherXact connected weather station, which senses temperature and humidity at 1.0m above ground and at crop level, together with the RainXact connected rain gauge and SoilXact, which records soil moisture and temperature at different depths. The FarmXtend App differs from other systems in its use of powerful algorithms to determine disease pressure, based on temperature and humidity, for a variety of crops, and thereby identify the optimum spray application times.